This is the page for the live chat with JT Waldman, artist of Not the Israel My Parents Promised Me, the final graphic novel by autobiographical comics legend Harvey Pekar. The chat was recorded live from 6:30-8:00pm eastern time on Wednesday, 5 December 2012. This free live video chat is part of the Tufts Experimental College’s “Religion and the Graphic Novel” course with Dr. A. David Lewis. 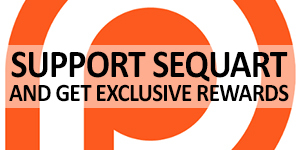 For more information, see Sequart’s press release on the subject or this page on Google+. Tagged art history, autobiographical comics, Harvey Pekar, Israel, Jewish culture and religion, JT Waldman, Not the Israel my Parents Promised Me, religion, Tufts University. Bookmark the permalink. A. David Lewis holds a PhD in Religious Studies from Boston University and teaches college-level Humanities classes in the Greater Boston area. He is the Eisner Award-nominated author of American Comics, Literary Theory, and Religion: The Superhero Afterlife and several critically acclaimed graphic novels. He has written for Patheos, FaithStreet, Publisher's Weekly, and the Huffington Post. See more, including free online content, on A. David Lewis's author page.